Just mention Scotland and iconic images spring to mind of bagpipes and kilts, castles and clan wars, highland cows and barrels of whisky. With the sound of the pipes swirling around and The Scotsman Hotel towering above me, I took my first steps out of Waverley station into the heart of Edinburgh. It's hard to describe the immediate sense of warmth you feel in the city (and not just because a rare sunny day was helping my numb fingers thaw out). Travelling up to Scotland by rail is the perfect opportunity to enjoy the scenic views country England is renowned for. The six-hour journey seemed to fly with an ever-changing view of mist-shrouded valleys and lush rolling hills. Waverly station is a divide between the Scottish capital's Old Town, with the iconic Royal Mile and medieval street plan, and New Town, with its neo-classical and Georgian architecture. A bed and breakfast seemed the best way to enjoy Scottish hospitality and Alba House, a Victorian-era home in Craigmillar Park, was budget-friendly luxury. The high ceilings and large sash windows overlooking the garden are a charming nod to the past, while the sleek ensuite and comfortable double bed made me feel right at home. Craigmillar Park is peaceful and quiet and just five minutes from the city by bus. If you're lucky enough to enjoy a sunny day in Scotland, don't waste it indoors. As soon as I'd dropped my bags off, I was ready to tackle the city's famous Arthur's Seat. It is quite the hike, but with stone steps forming much of the pathway the climb is achievable in trainers or everyday boots. 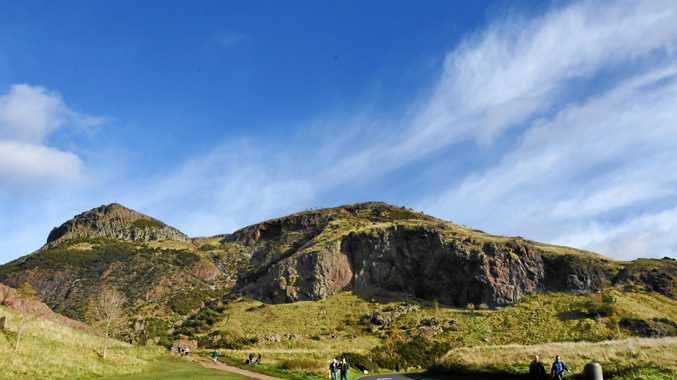 There are plenty of other smaller hiking options in Holyrood Park for those who can't brave the summit. However, the breathtaking 360-degree views are worth every step (as are the fierce winds, which will blast you from every angle). On a whim I decided a trip to Scotland wouldn't be complete without a visit to the highlands, however small, and booked a last-minute day trip with Rabbie's. The helpful Rabbie's staff found a tour that would give me everything I wanted in the highlands: picturesque views, small villages, and castles. Our small group set off bright and early the following morning with our delightful guide Shona. As city thinned out into motorway, Shona shared tales of Scottish myth and legend, including those made famous in Braveheart as we passed Stirling Castle. From a quick photo stop at The Kelpies, 30-metre-high horse head sculptures representing the mythical beasts said to have the strength and endurance of 10 horses, the motorway gave way to winding country roads. Doune Castle is a chance to discover an abandoned medieval stronghold with surprising freedom to explore the tight spiral stairways leading to hidden chambers. The intrigue, battles and plots I'd learned about in high school history filled my mind as I walked through the cold stone rooms and peeked through the windows across a picture-perfect autumn landscape. It was only the start of autumn, but a cold blast from the north had dropped temperatures to a chilling one degree in the highlands. Being a Queenslander, I was very thankful for our cosy heated tour bus. As we crossed the Highland Boundary Fault Line, rolling farmland turned into woods and rugged mountains. This landscape is every bit as iconic as Scotland's castles and an awe-inspiring sight comes at every turn. We stopped briefly to look over the calm waters of Loch Awe at melancholy Kilchurn Castle, built amidst famed clan wars and left to go to ruin on a rocky peninsula. Then it was time to explore the fishing village of Inveraray, perched on a sea loch and the perfect place to enjoy freshly caught seafood. From this charming village the tour took us through the steep winding Arrochar Alps to the Rest and Be Thankful pass. It is truly a mesmerising sight, worthy of the phrase inscribed on a nearby commemorative stone by the soldiers who built the original military road in 1753. As daylight faded we drove down to the "bonnie, bonnie banks" of Loch Lomond and walked through the quaint conservation village of Luss, where colourful flower gardens line thatched-roof cottages. I ended my last night in Edinburgh with a haggis pie on the way back to the BnB, but was not brave enough to try the famed IrnBru. Sadly I didn't see a hairy highland cow on my short trip, but I did enjoy plenty of busking bagpipers and enough of this beautiful country to know it will call me back.